It didn't take long to generate buzz about Planar's new PT2285PW 22-inch projected capacitive product released on January 10th! While at NRF, Matt Walsh, Touchscreen Sales Manager, was featured in a KioskMarketplace YouTube clip talking about the benefits of the new multi-touch 22-inch LCD product - like gesturing, flicking or scrolling through files or pictures and resizing images. Matt also talked about how the PT2285PW has a zero bezel, all-glass front surface making it easy to clean. Check out the touchscreen in the KioskMarketplace NRF wrap-up. 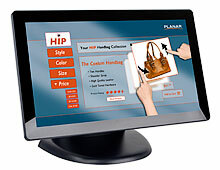 Then visit PlanarTouch.com to read about the PT2285PW multi-touch and find out how to buy!